We invite you to explore our campus and community, where we're hard at work enriching communities locally, nationally, and globally through academic excellence. As Nebraska's premier metropolitan university, UNO is committed to the needs of our community through teaching, research, and service. Our students graduate ready to contribute to the workforce and the community. Experience for yourself what life is like for a student at UNO. This free visit will include an Admissions Presentation, a walking tour of our Dodge campus, a tour of a residence hall and a shuttle tour of our Scott and Center campuses. You’ll also get the chance to meet with a representative from your program of interest during a Recruitment Meeting. Due to New Student Enrollment, recruitment meetings are only offered September – April. Explore your specific college more in-depth with our College-Specific visits. These free visits include an admissions presentation, a deeper look into the programs that your college offers, a behind the scenes tour of your college’s building and a tour of UNO’s campus. These visits are only offered during the Fall semester (August-December). Want to come on a campus tour, but can't get away during the typical 8-5? Join us in the evening for "Discover After Dark." This option will include a brief overview of the Maverick experience, a walking tour of Dodge Campus (including a visit to the residence halls) and a shuttle tour of our Scott and Center Campuses. If Saturday tours work best for your schedule, come check out our "Mav Weekender." 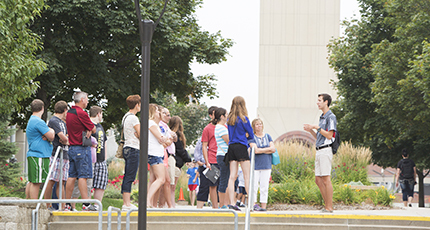 This exclusive Saturday visit will include an Admissions Presentation, a walking tour of our Dodge Campus, a tour of a residence hall and a shuttle tour of our Scott and Center Campuses. Prospective and incoming transfer students (students who have attended college after high school) are invited to attend UNO Transfer Day. This event will help you explore our academic programs, the transfer admissions process, how to evaluate your transfer credit, and introduce you to resources and opportunities available to you at UNO. You will also get the opportunity to tour campus and meet advisors as well as current transfer students. Group visits are available for student groups of all ages. If you're interested in bringing a group of 10 or more students, fill out the Group Visit Registration form online. Want to bring a group of 10 or more students? Fill out our Group Visit form to request a "Maverick-bound Tour". This group visit can include an Admissions Presentation, a walking tour of Dodge Campus, and an optional lunch. Requests must be made at least 4-weeks in advance. What better way to get your students excited about going to college, then to have them come to campus and experience it first-hand? Through hands-on experiences, our brand new “Youth Adventures” is bound to spark their interest in attending UNO. Due to the nature of these visits, space is limited and we will need at least 4-weeks’ notice to schedule your group. Sign-up today! Experience for yourself what life is like for a student at UNO. Your digital tour will include Dodge, Scott, and Center Campuses, including UNO’s on-campus residence halls. It’s easy to access this free digital tour on your smartphone or mobile device. The Maverick Family is looking forward to welcoming prospective students and Omaha visitors.